When properly applied, a sealer should either be invisible to the naked eye (if it’s a penetrating sealer), or have an even, consistent gloss finish (if it’s a topical sealer or coating). When a sealer isn’t applied properly – aside from not working effectively – it can look patchy and uneven. This is particularly disconcerting when the product is meant to be an invisible sealer! Often these sealer marks are caused by incorrect application techniques, but it can also be from choosing the wrong sealer for the surface. How can I avoid sealer marks? All sealers should be applied in accordance with manufacturer’s instructions. These instructions do not include the ‘tricks’ that specialists learn working with products over extended periods, and so the only foolproof way is to employ a specialist such as Slique to seal your stone or tiles for you. A Slique Stain-Guarding treatment is guaranteed to be effective and lasts for an average of 10 years if maintained in accordance with instructions. Choose the right sealer for your surface. It should be specifically designed for porcelain, marble, sandstone – whatever surface you have. It should also be suitable for use in the environment that the tiles are laid in – for example inside or outside, commercial kitchens, or heavy traffic areas. You get what you pay for. Cheap sealers don’t work as well, and don’t last as long. 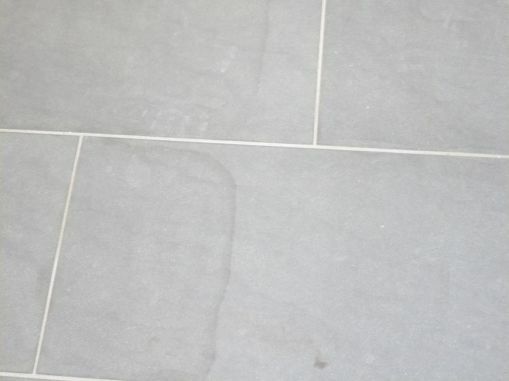 If you’re serious about protecting your stone or tiles, don’t skimp on your choice of sealer. Follow the instructions. This is especially important if you’re doing it yourself – the manufacturers instructions are written for anyone to be able to follow, and they’re the only way you can be fairly sure to avoid sealer marks and other problems. Don’t hesitate to seek professional advice from your supplier. They should be fully trained in the products and how to use them. Can sealer marks be removed? Generally sealers are designed to protect a surface for between 5-15 years. By nature, they’re designed to bond to the stone or tile and stay there for a very long time. This makes them very hard to remove, especially if they have ‘cured’ on the surface. Removing a sealer is impossible without professional help. Slique has a range of chemical stripping processes that can be used to remove sealers or coatings without damaging the stone or tiles underneath. If you have sealer marks, you can book a free Slique Consultation – we’ll come and confirm your problem, and give you a quote for our Technicians to professionally restore the surface to as-new condition.